SWAN Hills Goju Ryu Karate students recently returned from karate’s birthplace in Okinawa, Japan, where they learned from masters Shigetoshi Seneha Sensei of Ryusyokai Karate-do and Takehiro Gaja Sensei of Matayoshi Kobudo (traditional Okinawan weaponry). As part of a rigorous two-week training schedule, several students and instructors were invited to test for their next rank. All were assessed by their masters on their knowledge and application of karate basics, individual and partnered kata patterns, and fighting techniques, with their peers present to observe, encourage and learn. Sensei Bob was promoted to higher instructor-level ranks in recognition of his knowledge and contributions to both karate and kobudo. Some of Sensei Bob’s students who assist under his guidance with training and coaching also attained higher levels, including senior students who stayed back to instruct classes at Swan Hills’ Midland and Mount Helena dojos, their promotions certified in Okinawa by Sensei Seneha. Assistant instructors Ian Smith, Leo Spiccia and Wolf Konrad, promoted to 5th dan black belts, were recognised as Senseis within the Swan Hills dojo. 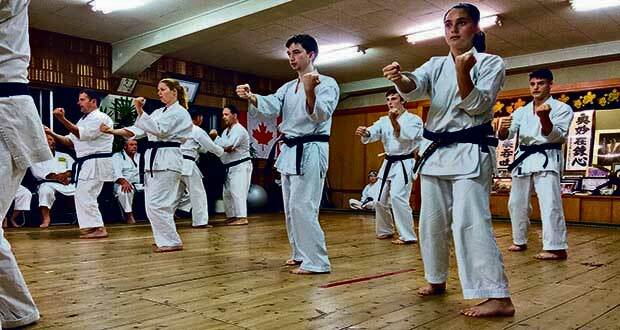 Damien Bell, instructor at Swan Hills Goju Ryu’s sister dojo in Bridgetown, received his 3rd dan. Tony Wray, Warren Hope, Lisa Skrypichayko, Pru and Beau Ruthofer also received 3rd dans, and Melinda Brezmen was promoted to 2nd dan. All participants gained valuable skills and insight into traditional Okinawan martial arts, developed greater awareness and appreciation of the unique cultural identity of the Ryukyu Islands in Japan’s Okinawa prefecture, and made lasting friendships in Okinawa and across Australia. Sensei Bob said he was surprised and honoured to be promoted, but was even prouder of the achievements and standard displayed by his students. “I have done the best I can to follow the tradition and show them the way, and the exceptional amount of time, spirit, and diligent practice they have put in has paid off,’’ he said. Sensei Bob Allen is the WA head of Goju Ryu Australia.